On February 6th 2019, citizens living in poverty in nine European countries will meet with the European Parliament for a dialogue on poverty policy. Since 1989, ATD Fourth World has partnered, most often with the European Economic and Social Committee, to organize the European Fourth World People’s University every two years. In various countries in Europe, the Fourth World People’s University allows those who experience deep poverty and exclusion to become active partners in building society. These meetings, which include people from other social backgrounds, provide a forum for those who live in poverty to bring their insights and knowledge to bear on the particular topics addressed in each session. The situation in Europe today is troubling. Eurostat figures from 2017 show that 113 million people in the European Union were experiencing poverty or social exclusion. The Europe Strategy 2020 aims to reduce by 20 million the number of people who, in 2008, lived in poverty. While there has been a slow decline in this figure, there is still a long way to go. In individual countries, Fourth World People’s University sessions provide a forum for people in poverty to discuss local or national issues with others concerned about poverty reduction. However, in view of the upcoming 2019 European elections, it is also important for this dialogue to occur in European institutions so that policies that leave no one behind can be developed at this level as well. Unfortunately, the opinions of citizens living in extreme poverty are often missing from both European institutions and national assemblies. Politicians are frequently out of touch with the reality and needs of the most vulnerable citizens that they represent. As a result, policy makers often approach poverty as simply an economic problem when it would be more effective to view it as a multidimensional phenomenon. Poverty is not only a question of economics. It also prevents people from exercising their rights and duties as citizens, and usually results in their exclusion from mainstream society. 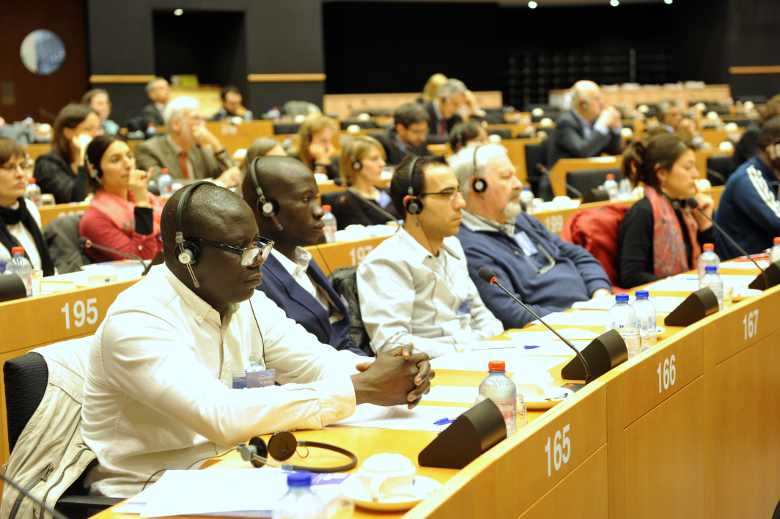 ATD believes it is important to address this lack of representation by reaching out to European level politicians through dialogues such as the Fourth World People’s University. These conversations are essential if European policy is to take into account the experience and knowledge of people who live in poverty. Indicators of poverty and social exclusion in Europe: In 2017 the European Union adopted a Pillar of Social Rights and a “social scoreboard” of dimensions and indicators to monitor implementation of this agreement. Do these dimensions and indicators adequately assess the multiple forms of poverty and exclusion? The impact that various national and European policies have on family life for citizens in poverty: Family policy itself is outside the jurisdiction of the European Union. However, European level policies in many other areas have an impact on citizens’ family life, e.g., policies related to economics and society, work and jobs, housing, health, and education. There is much that the European Union can do to improve the lives of its most disadvantaged families. Legal Status as a Person: Article 16 of the International Covenant on Civil and Political Rights states that “Everyone shall have the right to recognition everywhere as a person before the law.” However, many people living in Europe currently do not have a recognised legal status for a number of reasons. These include lack of access to legal status, an unstable housing situation, or not possessing the basic documents necessary to obtain the same rights that others have where they live. This lack of legal status can limit access to housing, work, health care, or even the right to vote. In addition, these people are often absent from official statistics. The goal of the European People’s University is to raise awareness among European politicians and policy makers of the difficulties that people in poverty experience on a daily basis in these three areas, and to work together to find solutions. To get ready for the European People’s University, delegates in each participating country will discuss these themes with the people they will be representing and develop proposals to present at the meeting itself. Several will have the opportunity to meet with an MEP from their own region or country.